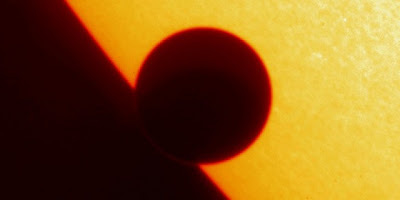 On June 5th and 6th 2012 the final transit of Venus across our Sun in our lifetimes will occur. The previous transit occurred just 8 years ago on the 8th of June 2004, however, due to Venus’ orbit relative to Earth the event is not a common one. The orbit of Venus is inclined by 3.39° with respect to that of the Earths (the ecliptic) it is the point when Venus’ orbit crosses the line of the ecliptic in front of the Earth. The orbit of Venus and the Earth cause them to line up every 1.6 years, however, and this is where the orbital inclination comes into play, due to the inclination of their orbits Venus will appear above or below the Sun as viewed from Earth, sometime by as much as 9°. The Transit Motion Applet shows how the orbital motion of Venus results in a 243 year cycle that consists of, two transits 8 years apart a 121.5 year gap and another two transits 8 years apart followed by a gap of 105.5 years before the cycle starts again. The last transit pair occurred in 1874 and 1882, 121.5 years ago; this means that it will be a further 105.5 years until the next pair of transits in December 2117 and 2125. Throughout history the motion of Venus has held special significance; however, it was not until 1639 that a transit was observed by two British astronomers Jeramiah Horrocks and William Crabtree. The transit of Venus was first predicted by calculations conducted by Kepler that suggested that the transit in 1639 would be a near miss, yet recalculations by Horrocks showed that the transits would occur in pairs 8 years apart. The next transit pair did not occur until 1761 and 1769 where a number of expeditions set out across the Earth with an aim to use the transit to measure the precise distance between the Earth and the Sun. It is a great example of International scientific collaboration (1). During this year’s transit scientists will use the Hubble space telescope to observe the transit of Venus by observing the shadow it causes in the reflected light on the moon (using the moon as a mirror). This data will hopefully allow us to determine the structure of Venus atmosphere in an effort to test a technique used in the study of exoplanetary atmospheres. With the knowledge we already have of the atmosphere around Venus this transit could represent a great opportunity to further our knowledge of the observations we make of alien worlds. Below is a map of the observation points for the upcoming transit followed by some links for how to observe it. Also check out events in your local area because this is not to be missed unless you know something I don’t know and plan to be alive in 2117 for the next event. A special Venus Transit event will be held at sunrise on the 6th at the University of Exeter, UK keep an eye out for further information.